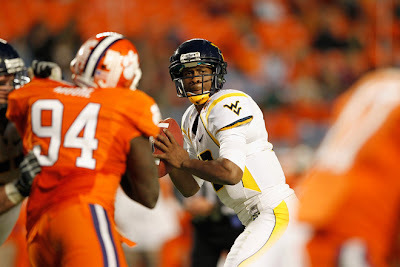 #23 West Virginia 70, #14 CLEMSON 33 -- Clemson, playing in their first major bowl game in 30 years, jumped out to an early 14-7 lead before committing three turnovers and giving up a record five Mountaineer touchdowns in the second quarter. Game over. Way, way, way over. West Virginia quarterback Geno Smith tied the record for any bowl game with six touchdown passes, and the No. 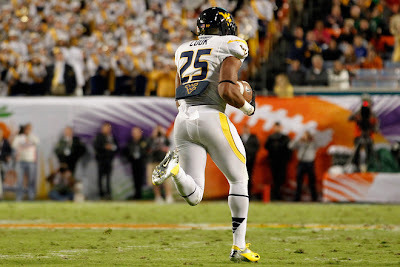 23-ranked Mountaineers set a bowl scoring record Wednesday night with their high-powered offense. That said, it was safety Darwin Cook’s pivotal play returning a fumble 99 yards for a touchdown to break the game open. Cook collided comically with mascot Obie after scoring one of the Mountaineers’ five TDs in the second quarter, including three in the final 2:29 for a 49-20 lead. It was the highest-scoring half by a team in a bowl game. EVER. 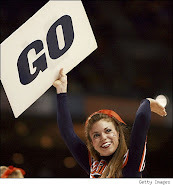 In all the best team from the now second-worse B.C.S. conference set or tied nine records. No, that’s not a misprint, that’s NINE. West Virginia’s Tavon Austin (who evidently is unable to step out of bounds, even accidentally) scored every time he touched the ball -- not really, it just seemed like it. He did tie the record for any bowl game with four touchdown catches. Smith went 31 for 42, and had 401 yards passing to break Tom Brady’s Orange Bowl record. 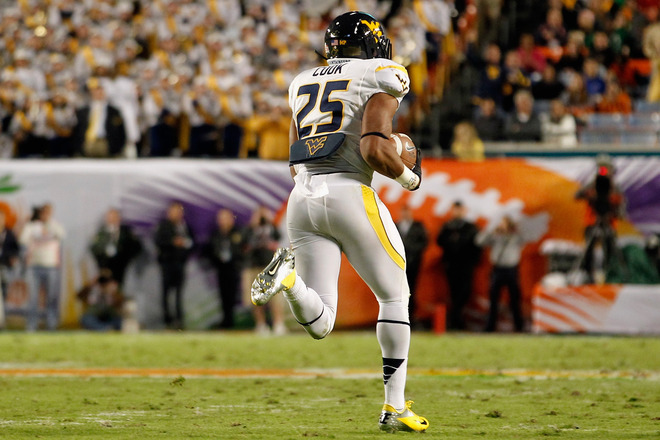 Smith also ran for a score, helping West Virginia break the bowl record for points established six nights earlier when Baylor beatWashington 67-56 in the Alamo Bowl. 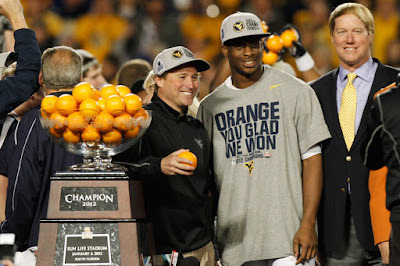 The Mountaineers (10-3) won in their first Orange Bowl appearance and improved to 3-0 in Bowl Championship Series games. The ACC’s overall record in BCS games fell to 2-13. The game featured over 1,000 yards of total offense. West Virginia totaled 589 yards and 31 first downs and QBSmith was chosen the game’s outstanding player. The Tigers put up 443 yards.